Irfan Khan, CTO for SAP Global Customer Operations, opened his keynote by emphasizing SAP’s open-source credentials, including contributions to over 100 different projects. For example, SAP has 50+ committers in the Eclipse community and has contributed more than 4.6 million lines of code. 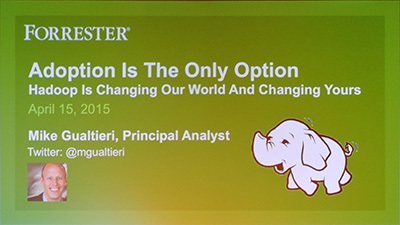 It’s clear that in order for Hadoop to reach the next level of enterprise adoption, it will have to link more tightly with existing information systems. 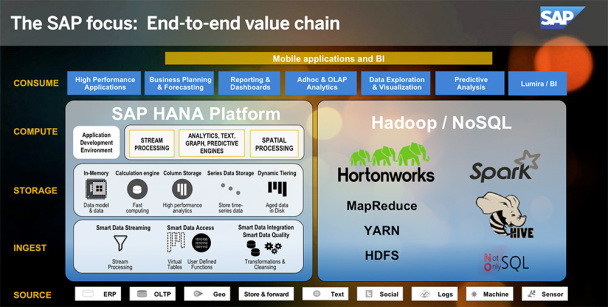 The SAP HANA platform can leverage the Hadoop ecosystem in a number of ways, from streaming data to virtualization and federation: pushing queries down into Hadoop and having the results sets returned, to kicking off MapReduce jobs. It allows for the relatively seamless integration of the power of HANA’s in-memory speed and powerful engines and libraries with the mass storage and distributed processing of Hadoop. 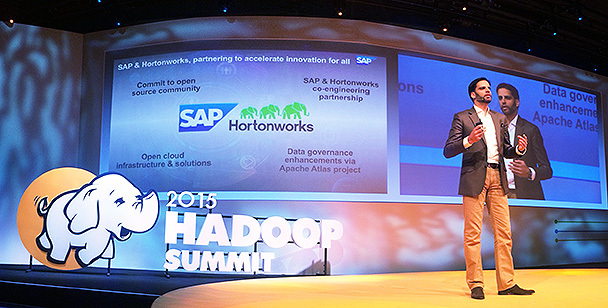 More information about SAP’s Hadoop initiatives and plans will be available at SAPPHIRE NOW in Orlando.